Much like a blue print for a house, a management plan is a reference guide to be used by landowners and resources professionals to aid in the sustainable management and protection of our forestland resources. Management plans are written by foresters and reflect the goals of the landowners for their property. The plan helps them reach their goals by providing guidance and technical advice. What is the Management Plan process like? Our foresters meet with the landowner(s) and interview them to establish some goals for the property. Generally there are short term and long term goals. Short term goals may include hosting a timber harvest to create wildlife habitat or to generate income for other projects. Long term goals may be to establish an orchard, red pine plantation, or improve the soil for a food plot. Our foresters make a map of the property in which the property is divided into stands. 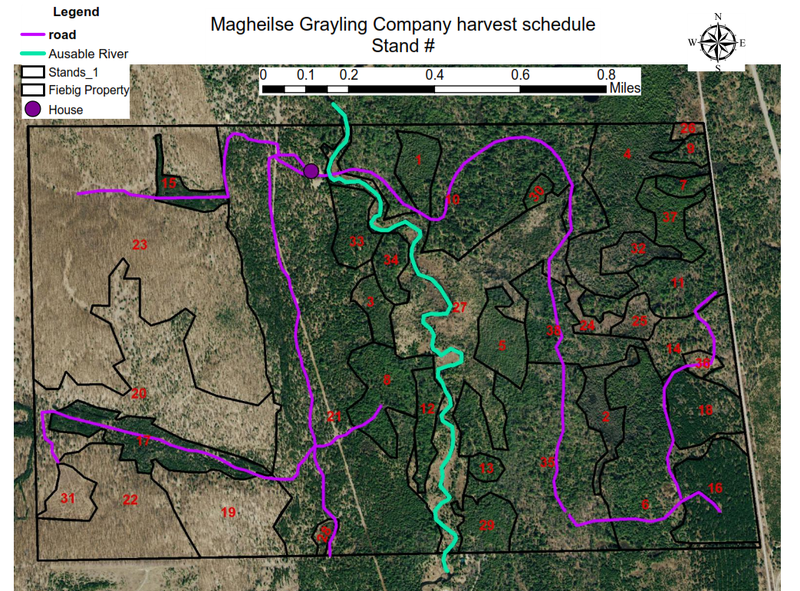 The stands are delineated based on ecosystem type, past management practices, stocking levels, or future goals using digital aerial photos, GPS units and Geographical Information System (GIS) software. Our foresters then assess stand resources and determine if the goals are feasible for the property or make recommendations. The goals are prioritized and the plan is written. The landowner reviews the plan with our forester and approves of the plan or makes changes. The plan is then finalized by signing it. It is then up to the landowner to implement the plan and recommendations. What are some of the benefits to having a Management plan? Management plans are a written assessment of the forest resource. They identify areas to be managed and the type of management needed to achieve the desired goal for that particular area and its priority. This provides the landowner with a guide of where to begin to achieve their goals. Other benefits to having a management plan are to bring multiple stakeholders in agreement on how to manage the forest resource. Large landowners or landowners with a highly diverse forested landscape will benefit most from having a management plan. Management plans are required to enter into programs like Commercial Forest (CF) and the Qualified Forest Program (QFP). These programs provide property tax reduction for landowners. Various cost share programs through governmental agencies will require that a landowner have a management plan and will specifically addresses the activity to be performed. How long is a Management Plan good for? In general, management plans have a timeline of 10 years but not more than 20. At this time the old plan should be reviewed and goals should re-assed and a new plan should be written. However, plans can be amended any time during the life of the plan to reflect a change in the landowners’ goals or to address an unexpected event such as a forest fire or disease outbreak. Additionally there is cost share funding through the Michigan DNR to offset the cost of a forest Management Plan.